Do you want to learn how to play the flute? Look no further! During a Corinne flute lesson, you will learn how to create beautiful sounds first and foremost. This is the basis of great flute playing. Once you are producing some quality sounds, we will move on to learning notes, reading music, and accomplishing your goals! Aside from perfecting flute technique, we will also work on musicality and listening skills! These skills are important in bringing music to life. If you already know how to play the flute, but would like a little more help, I will continue your education in whatever direction you would like to go. Corinne delivers an exceptional lesson experience and ranks in the top 15% of our teachers nationwide. I believe that goal-setting is an important life skill that can set anyone on a path to greatness – as long as they know how to follow through. I have taught clarinet, saxophone, and flute lessons since 2010. Several of my students have continued pursuing music in college, and several have accomplished goals such as learning how to play the clarinet, earning a spot in their state's All-State band, and earning a spot in community honor ensembles. I previously taught music to K-5 students. I saw 550 students throughout the week. I have completed Levels I and II of the Orff-Schulwerk teacher education course. Each course is a two-week professional development class from 8am-4pm from Monday to Friday. During this time, music teachers learn how to teach in the Orff Schulwerk approach to music education: teaching through singing, speech, movement, and play. 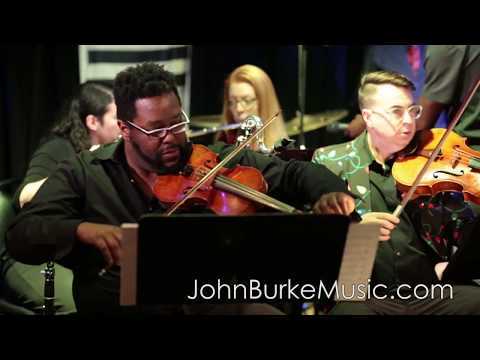 This is a mash-up of rehearsal footage where I played woodwinds for the album The Longest Night by John Burke. An action shot of a recent show! Me and the band for the full stage production of A Christmas Carol. Corinne is a great instructor. She's patient and makes the lessons fun for my 10 year old daughter. My daughter was excited for her next lesson with Corrine! Corrine has worked with the clarinet section at my school from my freshman year all the way up to my senior year. She has always been caring and loving towards us and creates a friendly and fun environment when teaching. Her lessons are thorough and engaging so that when you leave, you don’t feel overworked, yet you feel a sense of accomplishment at having learned something new. I LOVE Corinne. She's helped me so much with learning clarinet. She's very clear and easy to learn from plus she's super funny and fun to be around. She's helped my practice techniques a ton! 10/10 teacher. Corinne has good tips for a beginner. It’s a pleasure to get to learn with her. Learning from Corinne was a wonderful experience. She is an outstanding individual who truly furthers your progress in clarinet-playing. The techniques and exercises she teaches are great assets for any performer. She worked with the clarinet section all 4 years I was in high school and she was awesome. I hope she does well in the future! I’m an Oboe player, but Corinne helped me go from knowing little to nothing about the clarinet, to being able to successfully play at the level that all of the other clarinet players around me could. I have had the pleasure of being taught by Corinne for 3 years now, and not only is she a terrific clarinet instructor, she is also a great person! Corinne always has the best positive attitude and encourages me to continue when I get frustrated. Having a great instructor is vital to improving performance and Corinne is that great instructor. I have loved working with her over the past years and I would continue to work with her forever if I could! 11/10 recommend!! I have been working with Corrine since middle school and she has guided me into the top band of my high school. The fundamentals she has implemented into me have stuck since my first lesson with her in sixth grade. She is able to build a clarinetist from the ground up by starting with a solid foundation then progressing to advanced musicianship. Corrine is excellent at assessing my problems and coming up with unique ways to solve them that kept me engaged in the lesson and inspire me to pursue my passion for the Clarinet. I prefer her over other tutors because she is very problem solving based. Corrine is able to identify and analyze my problems and come up with clever and efficient exercises to help me with my personal needs. Another reason I continue to enjoy practicing with her is that she is very easy to communicate with and she explains her solutions to my problems in a way I can understand easily. Corrine is an amazing teacher and very friendly. Most of all, she actually cares about me and my problems and she really wants to see me grow my skills to become a better clarinetist by sharing her true passion for the instrument. Absolutely fantastic tutor. Always very energetic and ready to help you improve. Every lesson was very in-depth, and was always very helpful with finding out where to improve and how to practice more effectively. Could not recommend Corinne any more! Corinne is an absolutely wonderful instructor! I took private lessons with her in middle school, and she not only gave me the skills to master several auditions but refined my techniques and reformed bad habits that I had acquired throughout my clarinet “career”. She enabled me to build strong practice exercises that worked specifically for me after observing how I worked as a clarinetist. Our relationship continued as I moved into high school concert and marching band as she was our clarinet instructor for various workshops and sessions. She helped me learn to lead and instruct others in my section in the role of section leader. My growth continued (even after my private lessons ended) as she learned my strengths and weaknesses in an individual and group setting. Without Corinne, I definitely would not have the accolades and/or titles in the realm of music that I have now. As an instructor, Corinne doesn’t simply care about the short term goals or specific event to which you may come to her for assistance, but she cares about the musician you will be and techniques you will possess in the long term. She will work with you to find the best foundation upon which you can build up skills, a fine repertoire, and wonderful musicianship. I have had the pleasure of working with Corinne for over 5 years now in various settings, and I can say without a doubt that there is no one better for any clarinet instruction you may need! Ms. Klemenc is one of the best clarinet instructor out there. She helps you exceed expectations and she also makes private lessons fun! Absolutley one of the best clarinet instructors! She is able to teach musicality and technique at the highest level. Always extremely professional. Highly recommend.